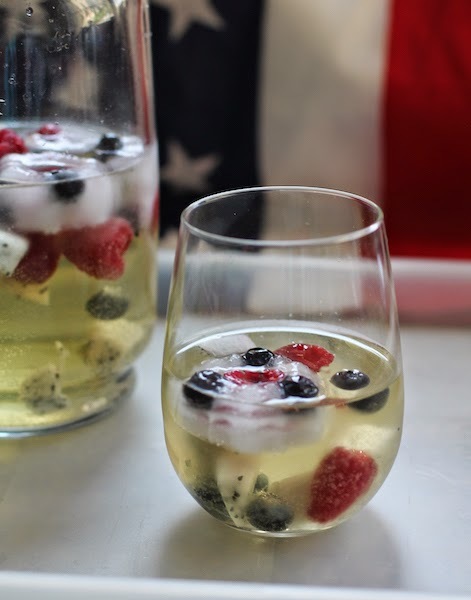 Crisp dry white wine, mixed with a little lemon vodka and Grand Marnier, then topped up with lemon-lime soda and lots of pretty fruit, makes a refreshing libation for summertime. 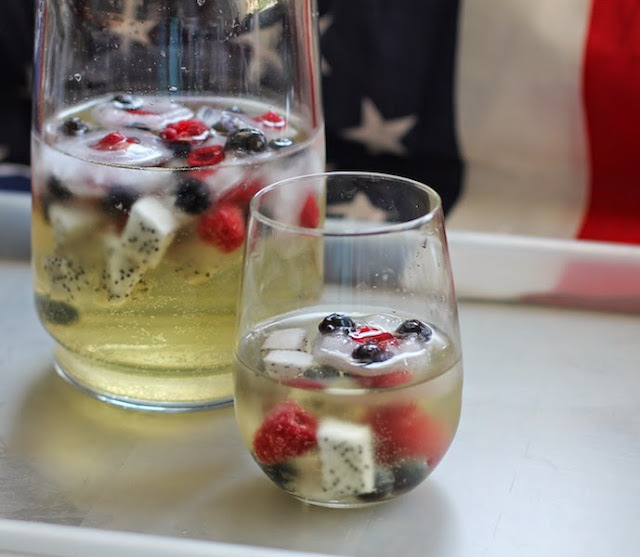 This week Sunday Supper is remembering all those who made the ultimate sacrifice in our armed forces, just ahead of Memorial Day tomorrow, by showing off our red, white and/or blue recipes. Even as you feast and enjoy the extra day’s holiday – if you are living in the US, that is – we hope you will be inspired to honor military personnel from every country who died to preserve our freedoms, including those who put themselves in harm’s way to bring aid to the needy and try to ensure safety and peace in troubled regions worldwide. (Did you know that there are more than 30 countries whose flags are red, white and blue?) Unlike Veteran's Day, which honors the service of all soldiers, Memorial Day is especially to recognize those who gave their lives. Many thanks to this week’s host, the great DB from Crazy Foodie Stunts. Make sure you scroll on down to the bottom of my post to see all the colorful recipes we are sharing today. Let me introduce this sangria ingredient list with a disclaimer. When I told my husband that I was making sangria and, did he want some, he said, “Nah, thanks. I’ll just have a cold beer.” Well, I’m all for taking one for the team, particularly my Sunday Supper group, but drinking an entire one-wine-bottle batch of sangria seemed ill-advised, so the amounts you see here photographed are for half of the recipe I share below. And, yes, I did drink the whole darn half pitcher over the course of a hot afternoon! It was refreshing and delicious. 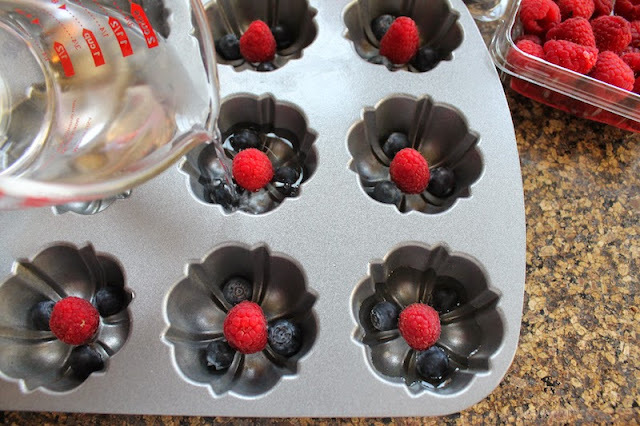 Starting at least a day ahead, wash some of the blueberries and raspberries and put three blueberries and one raspberry in several of the holes of a muffin pan. For a more decorative look, I used the Nordic Ware one known online as the Bundt Brownie pan. 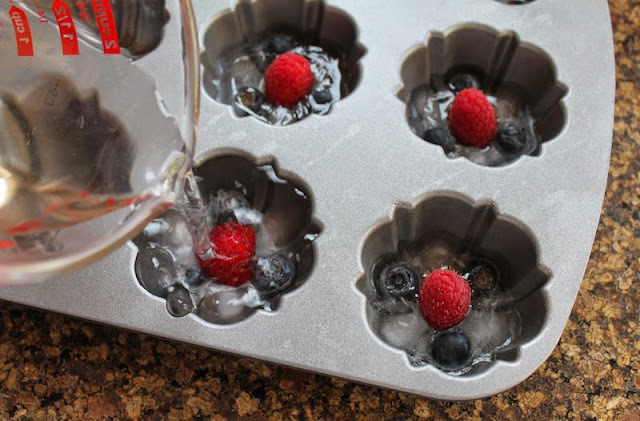 <affiliate link Add a little water, until you see the blueberries just barely start to float. Put the pan in the freezer and leave until the water freezes enough to hold the fruit in place. Top up with more water and freeze until solid. 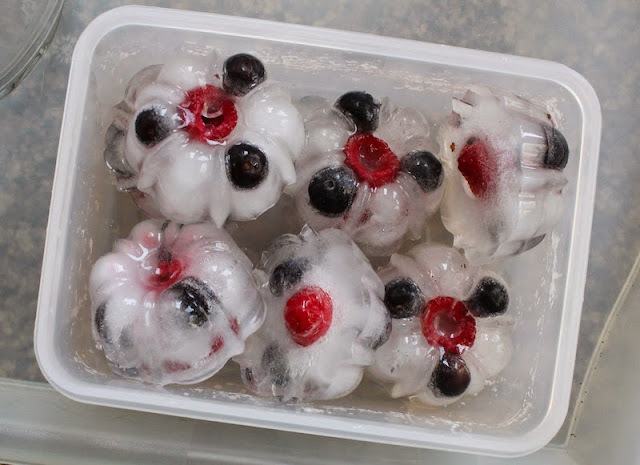 When the fruity ice is frozen, release by running some water over the back of the pan and store in a airtight container in the freezer. 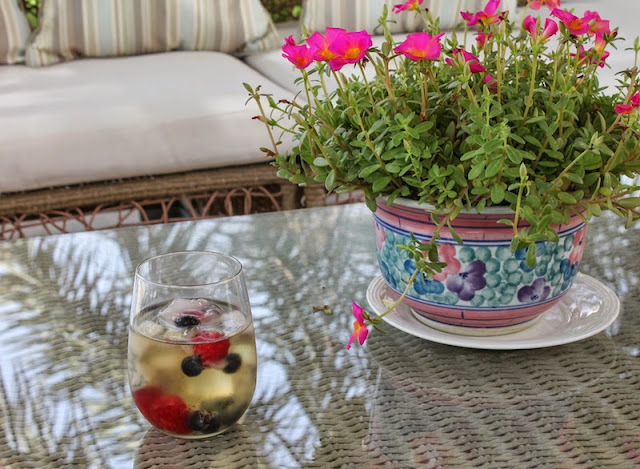 If you want to skip all these steps and get straight to the sangria, just use normal ice cubes. 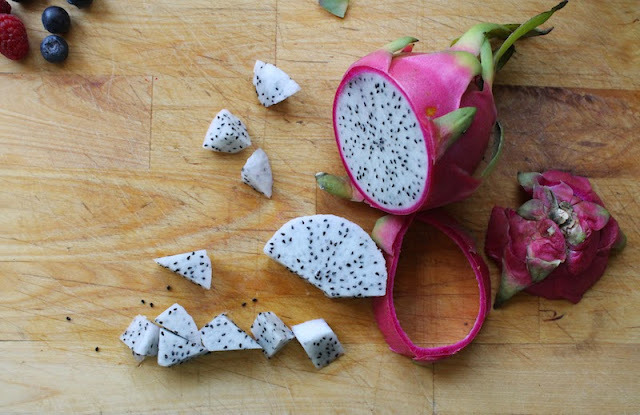 When you are ready to serve, peel and slice your dragon fruit and cut it into pieces about the size of your raspberries and blueberries. Wash the berries and drain well. 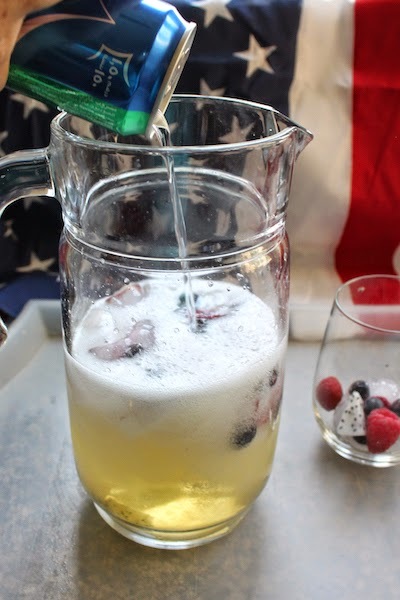 In a pitcher, combine your wine, vodka and Grand Marnier. Add your fruity ice (or just some normal ice) and then top up with the lemon-lime soda. Add in more raspberries, blueberries and some of the cut dragon fruit. 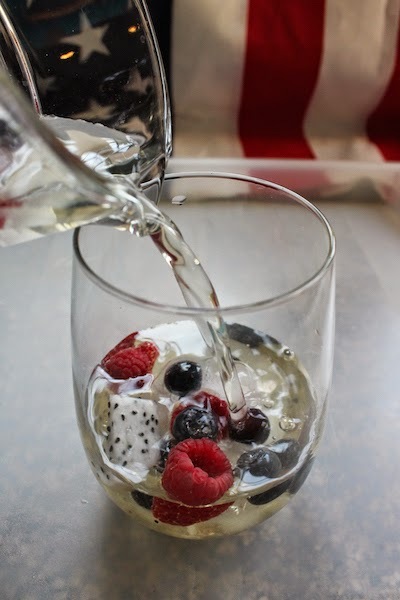 Put some berries and dragon fruit and ice in each glass and fill up with sangria. And make sure to check out all the other great red, white and/or blue recipes we have for you today. Sangria outside on our new-to-us outdoor sofa set. Doesn't it look refreshing!